Many of you may have heard about the New Heart2Heart by ErgoBaby and wondered what it was all about. Well, we recently had the opportunity to get our hands on one of these accessories and I’m going to tell you all about it! Heart2Heart by ErgoBaby is a new infant insert designed to be used in conjunction with the ErgoBaby carrier (If you are unfamiliar with the ErgoBaby carrier or would like more information, you can view my original post HERE). The ErgoBaby along with the new Heart2Heart infant insert, will allow you to use only one carrier from birth to around 4 years old. Saving you time and money in the process! In 2004, ERGObaby began offering the Original Infant Insert; a design that supports newborns in the cradle position. Since then, research studies, input from chiropractors, customer feedback, and our their own experience with newborns have resulted in the newly redesigned infant insert: Heart2Heart. This innovative design includes cushions at the back and bottom to support the natural curvature of a baby’s developing spine. The Heart2Heart also promotes healthy maturation of the spine by supporting the pelvis, hip joint, and leg position, rather than putting the baby in a compromising sitting or hanging position before the spine is ready. Additionally, the ERGObaby Infant Insert supports the baby’s head and neck in this critical stage of development. Importance of inward facing carriers…. In the first four months of life, it’s important to have your baby facing inwards (towards mom or dad) and not outward facing. Not only is this important for emotional development but through extensive research, ErgoBaby found that the design encourages healthy maturation of the spine by supporting the pelvis, hip joint, and leg position rather than putting a baby in a compromising sitting position before the spine is ready. 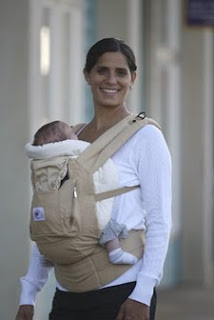 The ERGObaby Infant Insert also supports the safety of the baby’s head and neck in this critical stage of development. Oh My! We have an opinon….We found the infant insert to fit nicely in the the ErgoBaby carrier and the fabric is very soft, ensuring that infants are not only in the safest possible environment while in the Heart2Heart, but also in the comfiest! We found that you can really pull and wrap the insert around the baby to perfectly adjust their comfort as well as yours. A big bonus with the New Heart2Heart insert is that if baby’s sleeping and you need to put them down, you can just unsnap the ErgoBaby carrier and take the baby out while still in the infant insert! Keeping baby asleep and mom and dad happy! I would have jumped at the chance to use this infant insert when Siena was a newborn and I know all of you will love it too. This giveaway is for those of you who currently own an ErgoBaby carrier or plan on purchasing one in the future. ErgoBaby is offering one lucky “Deal”ectible Mommies reader a chance to Win a Heart2Heart infant insert! Just visit ergobabycarrier.com and tell me which one of the inserts is your favorite! I personally love the galaxy print! Extra Entries: The initial entry MUST be completed before any extra entries will count!! All Extra Entries will be left in the “comment” section of this post! Each comment counts as 1 entry..so if you qualify for two entries, then leave two comments!!! Win the New Heart2Heart Infant Insert from ErgoBaby! Already following me on twitter? Send out the above tweet and you just earned yourself an entry.. drop me a comment and let me know! 2. *2 Entries* Subscribe to “Deal”ectible Mommies by Email or Subscribe to my feed. 3. *2 Entries* Follow “Deal”ectible Mommies…You can Follow My Blog on my sidebar..hint: It’s at the very top! The boring stuff: Open to U.S. and Canadian residents only. Giveaway will end on October 19th at Midnight! Winner will be chosen using random.org! Giveaway Disclaimer: Our giveaway sponsors are responsible for shipping and fulfillment of any winnings here at “Deal”ectible Mommies. Please allow 6-8 weeks for delivery of any prizes won here at “Deal”ectible Mommies! Although your prize may be out to you much sooner, it may take up to 8 weeks for delivery! BargainJill: Bargains and Deals just for Women!